Four albums' worth of vintage ska from the Jamaican scene – presented here with a heck of a lot of bonus tracks too! These tracks are the real deal – some of the earliest tracks to be circulated under the name of the new style – and the sorts of songs that just about everyone tried to copy right off the bat, and kept on trying to match for decades more! The work all comes from the magical fingers of Duke Reid, of the Treasure Island label – and there's a fair bit of jazz in the mix too, as these groups are overflowing with talented musicians who were playing straighter jazz just a few years before. 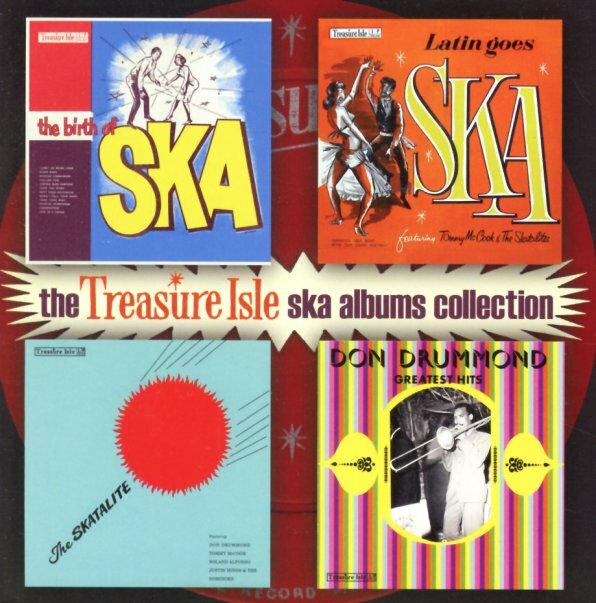 The package features the full albums Birth Of Ska, Latin Goes Ska, The Skatalite, and Don Drummond's Greatest Hits – plus 19 more bonus tracks – with work by Duke Reid's All Stars, Don Drummond, Botty & Bonny, Rico Rodriguez, Justin Hinds & The Dominoes, Owen & Leon Silvera, Eric Morris, Roland Alphonso, Clive & Naomi, The Richards Brothers, Baby Brooks, and many others. 58 tracks in all! © 1996-2019, Dusty Groove, Inc.